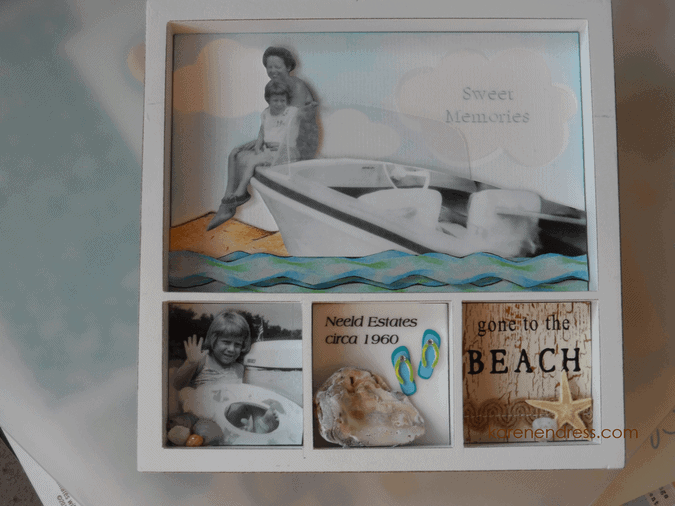 Thought some of you might be interested in this memory box I made for my mom with several photos from our family’s cottage on the Chesapeake Bay. I had NO idea how this was going to come together, so I just started by picking a small white 7 Gypsies shadowbox (stash). 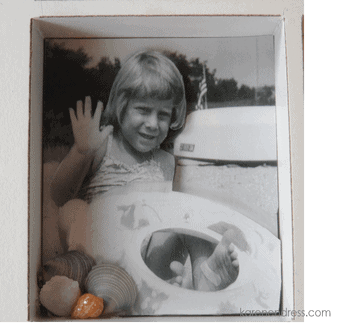 I printed three copies of each photo because I knew I would mess up and it’s a good thing, especially the boat pic. That took many tries because I had to cut four people out of the photo to make it just my mom & me 🙂 Getting the acetate positioned for the boat windshield was no picnic either! 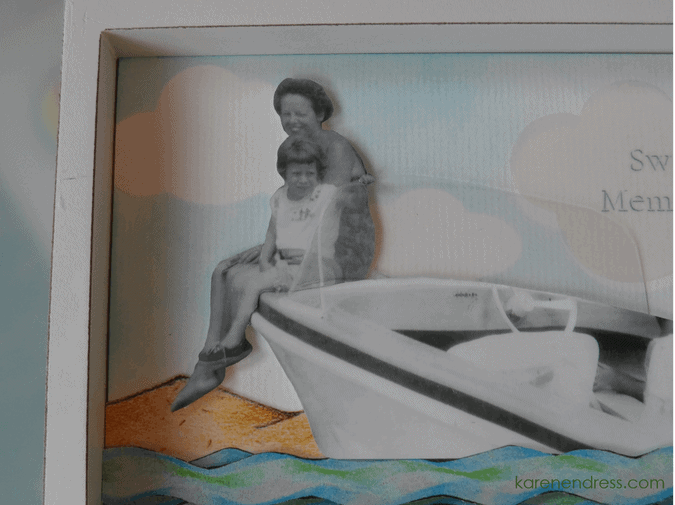 The boat needed a background, so I took a piece of textured cardstock, masked off some clouds (MFT Cloud Trio & Simon Says Stamp Talk Bubbles) and lightly sponged some Distress ink over the background. Since the photo didn’t show the entire boat, I needed something to cover up the bottom. 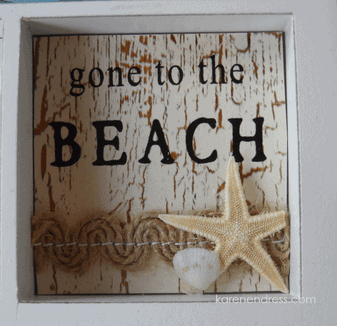 Head to my ScrapRack’s “Summer” section for some inspiration! 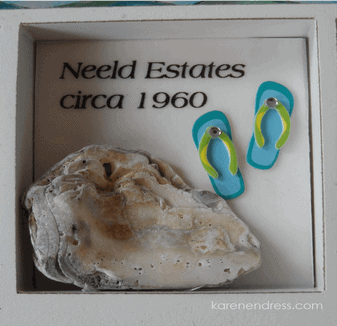 I pulled quite a few items that didn’t make the cut, but did find a use for the sand and waves border stickers, “Gone to the Beach” embellishment, the flip flops and a small container of teeny tiny seashells I bought my daughter on a field trip long ago. I rescued it from a give-away pile when she was cleaning out her room. Good thing, huh? The embellishment in the right opening lost more petals every time I touched it, so I replaced the flower with a tiny starfish and shell. The middle section has an actual shell from our beach, one of maybe 20 I’ve saved all these years. Instead of stamping the date and place, I ran the vellum through my printer and carefully placed the adhesive under the flip flops and shell. The last thing I did was print out the sentiment onto vellum and die-cut one of the same clouds from it. I placed it over but slightly offset from the masked cloud on the top right. I did a lot of agonizing over all the details of this project, but in the end both my mom & I loved it! 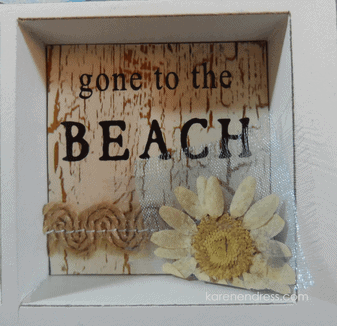 If one of my cards or projects does inspire your personal crafting and you share your creation in a blog or in a gallery, please link back to the Karen Endress Creations from the HeART blog as the source of inspiration. Any other form of republishing, selling, licensing, distributing, or exploiting any content and materials on the website, including using the content or material for challenges, contest submissions, or publications is strictly prohibited.